I have used my Grove Collaborative referral link throughout this post. I only ever feature products and services that I use and love. Welcome back to another Grove Collaborative unboxing. This is “kind of” an unboxing, because I already know what I ordered. It’s a lot of fun to share what we’ve ordered every month! 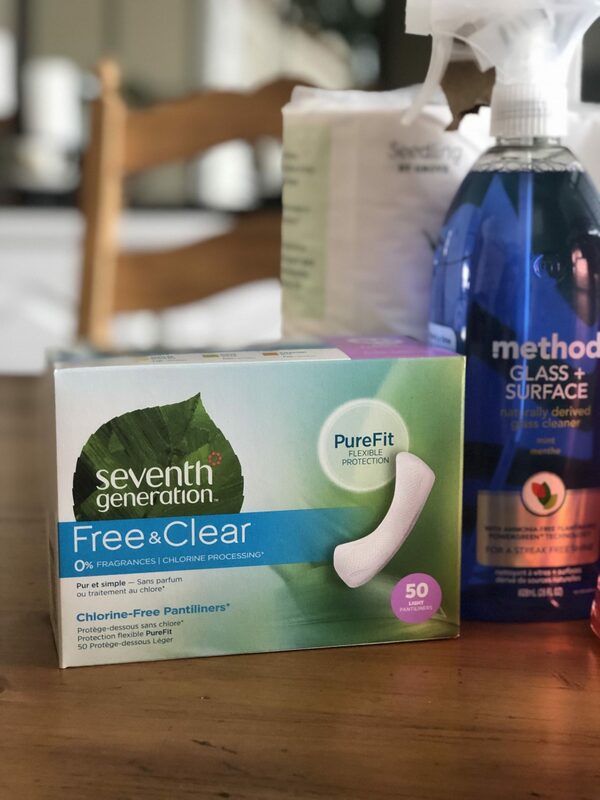 Seventh Generation has been my brand of choice for feminie products. Their products are chlorine-free, which is perfect for my sensitive skin. 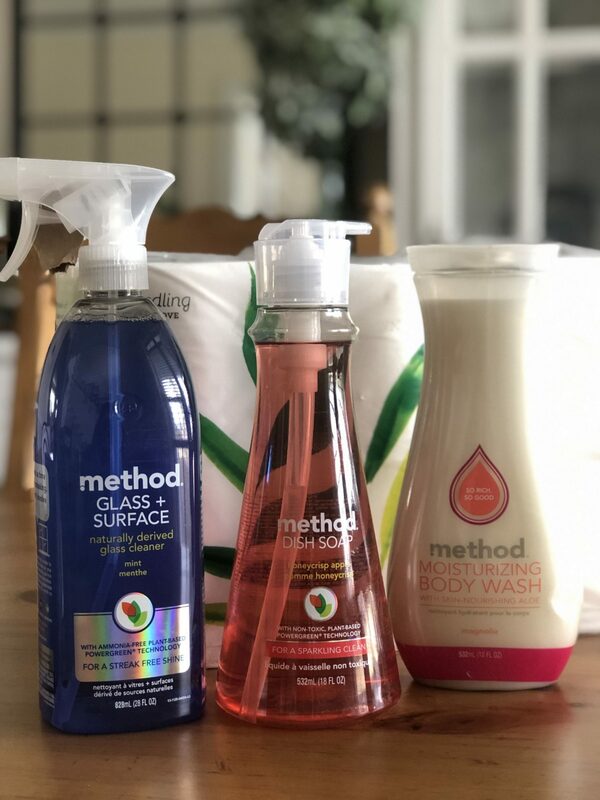 I can probably find a method product in every single room of my house, but that’s because they’re so good! This body wash is my and my daughter’s favorite. The scent is beautiful and floral without being overpowering. Once I switched my cleaning products to method, I didn’t look back at all. All of their products smell amazing and are very effective. This glass cleaner is a product I keep throughout the house in different rooms. It leaves all the glass and mirrors clean and streak-free. For dish soap, I switch between Mrs. Myer’s and method throughou tthe year. This month, I was in a method mood and went with the Honeycrisp Apples scent. It smells like spring and summer to me! This month’s order is chock full of my favorite brands. 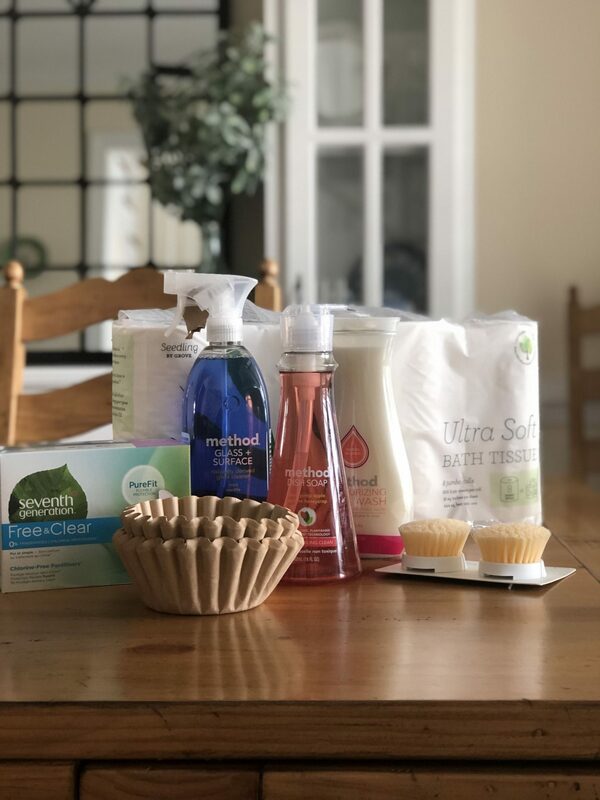 The Grove Collaborative dish cleaning products (brushes and sponges) are my favorites. 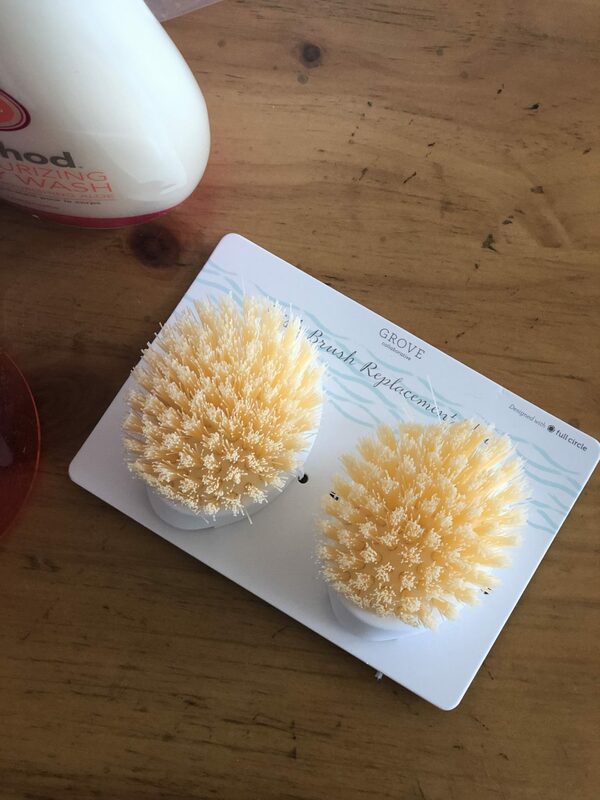 We have nearly all their products, and this dish brush has been so useful. When Grove launched the Seedling brand, I was immediately on board with it. We’ve tried nearly all, if not all, the products in the line. In fact, the offer for this month’s blog post is a Seedling Set from Grove! We like the toilet paper and napkins. 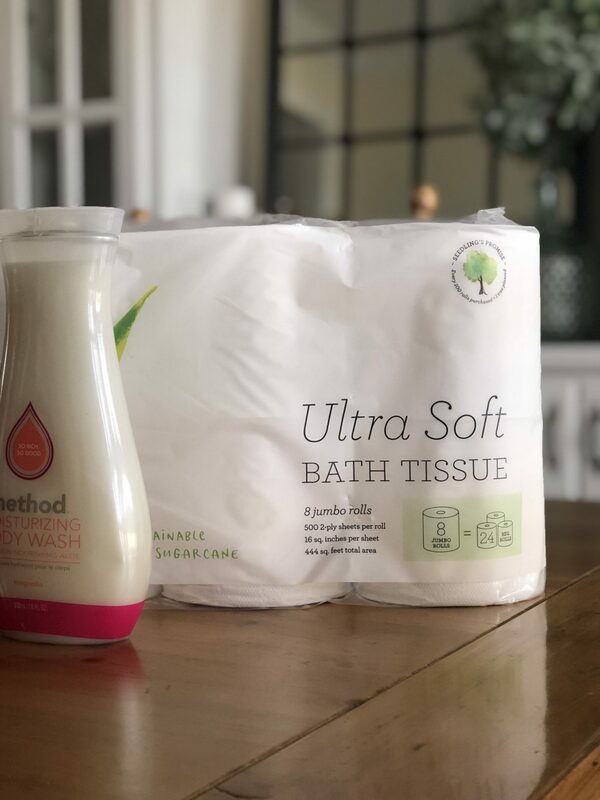 If you’re not entirely sure of it, the toilet paper reminds us of Scott tissue paper only softer. It’s made from bamboo and sugar cane, which are renewable resources. Last, but certainly not least, coffee filters! I’m not sure if I’ve ever shared these on the blog, but we use the If You Care brand. Their products are made from recycled materials and are bleach-free. 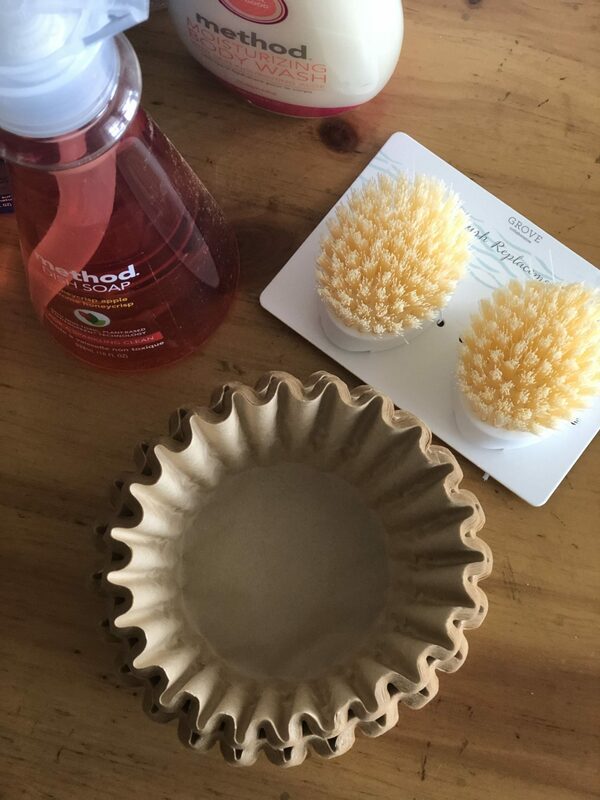 I use these coffee filters in our Mr. Coffee coffee maker (that we’ve owned for 5 years now and love). They are not in the box, because we were out of filters when our Grove order arrived. I tore open the box real fast to set the coffee maker time for the next day. This month’s offer from Grove is a free Seedling set plus a VIP membership trial. This offer is for new customers. Existing members will receive a free set of Grove Collaborative Walnut Dish Scrubbers.